Doug Ross @ Journal: OBAMA'S IRANIAN PARTNERS IN PEACE: Now Is the Time for a Holy War to Eradicate the Israeli "Cancer"
OBAMA'S IRANIAN PARTNERS IN PEACE: Now Is the Time for a Holy War to Eradicate the Israeli "Cancer"
Iranian Supreme Leader Ayatollah Ali Khamenei on Tuesday described Israel as a “cancerous tumor” and called for a “holy intifada” to destroy the Jewish state. Khamenei’s latest threat came in a speech introducing the regime’s sixth conference in support of a Palestinian intifada, or violent uprising against Israel. 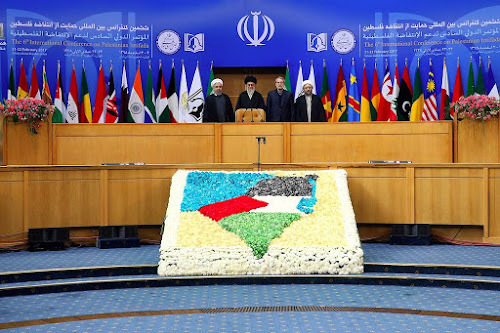 The conference was held in Tehran and had seats reserved for the heads of the terrorist groups Palestinian Islamic Jihad, Hamas, and Hezbollah, according to The New York Times. All three groups have received funds, intelligence, and weapons from Iran. The creation of Israel “is another dirty page in history which will be closed with the permission and assistance of Allah the Exalted, just like other dirty pages in history,” Khamenei said in his speech, according to a translation posted on his website. The Jerusalem Center for Public Affairs observed in a report published last week that the nuclear deal has not stopped Iran “from propagating Israel’s destruction.” Khamenei has been quoted describing Israel in July as an “illegal and filthy Zionist regime,” and long-range ballistic missiles tested by Iran in March had the phrase “Israel should be wiped off the map/face of the earth” written on them in Hebrew. “The combination of an extreme Islamist ideology that repetitively preaches the destruction of Israel, boasts of its advanced missile program and seeks to return to the bosom of the Western world makes Iran all the more dangerous,” the report noted. Ahmad Karimpour, a senior advisor to the Islamic Revolutionary Guards Corps’ (IRGC) elite Quds Force, said in May: “With the facilities and equipment we have, we can raze the Zionist regime to the ground in less than eight minutes if we ever decide to act, based on the Supreme Leader’s orders.” This was a reference to Khamenei’s 2013 promise to “raze Tel Aviv and Haifa to the ground” if Israel ever attacked Iran. This is the latest in a series of reports by the Jerusalem Center for Public Affairs cataloging promises by Iranian leaders to destroy Israel. The first report was produced in 2008, prompted by then-President Mahmoud Ahmadinejad’s 2005 comment that Israel should be “wiped off the map.” A followup report was issued in 2012, covering the threats issued against Israel by Iran’s leaders during the subsequent four years. A complementary report was published in 2013 following the election of Hassan Rouhani, the current president who was reputed to be more moderate than Ahmadinejad, and another was released after the conclusion of the nuclear deal in 2015. The 1948 Genocide Convention lists incitement to commit genocide as a war crime. Much of the Iranian language regarding Israel can certainly be legally defined this way. A common motif of incitement to genocide is the dehumanization of the target population. The Nazi weekly Der Stürmer portrayed Jews as parasites and locusts. In the early 1990s in Rwanda, Hutu propaganda described the Tutsis as “cockroaches.” Before Saddam Hussein’s operations against the Iraqi Shia population in 1991, his Baath Party newspaper characterized them as “monkey-faced people.” Similarly, former President Ahmadinejad has called Israeli Jews “cattle,” “blood-thirsty barbarians,” and “criminals,” while Iranian state-owned websites have explained why the destruction of Israel and the slaughter of its population would be justified. Dehumanization has also appeared in other forms, such as demonization, in which the target population is labeled “Satanic” – a theme repeatedly used by Iranian leaders to describe Israel.